Judge Hansen received her bachelor's degree in Nuclear Medicine Technology from the University of Wisconsin-LaCrosse and juris doctorate degree from the University of Utah. She was a Deputy District Attorney in El Paso County from 1986-1994, specializing in prosecution of crimes against children. Judge Hansen opened a private practice in 1994, with emphasis on guardian ad litem work in Juvenile Court. 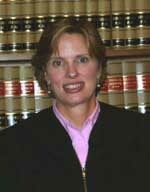 She was appointed as a municipal judge for Colorado Springs in 1998 and continued a part-time private practice. Judge Hansen was appointed as a County Court Judge in 2001, with a docket that includes misdemeanor criminal and traffic cases and civil cases. Judge Hansen's community interests include being a member of the Sanctuary Choir at First Presbyterian Church and was previously involved with the creation of the Child Advocacy Center for investigation of child abuse allegations.